The new GTC models share a fresh frontal appearance. The radiator grille is more upright with a more pronounced square edge, accentuating the Bentley profile, and bolder lower air intake. The latest models are further distinguished by chrome headlamp bezels, the availability of two new exterior paints and a new colour hide. The appeal of the GTC is further strengthened by the addition of the new 600bhp (610PS) Bentley Continental GTC Speed model. 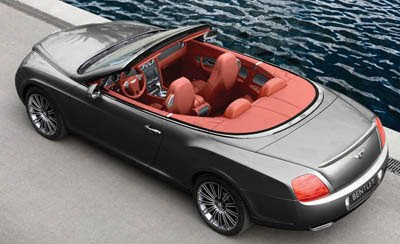 It is Bentley's most powerful convertible ever and inspired by Bentley's legendary 'Speed Models' from the 1920s. The GTC's chassis and exceptionally rigid steel body have proved more than capable of coping with the power of the 552bhp (560PS) 6-litre W12 engine. For the new Bentley Continental GTC Speed, twin-turbocharged W12 now develops 600bhp (610PS) that delivers true 200 mph (322 km/h) performance, with the roof up, with exhilarating, effortless acceleration. 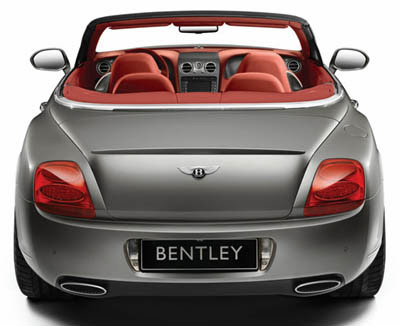 Even with the roof down the Bentley Continental GTC Speed can reach 195 mph (312 km/h). The Bentley Continental GTC Speed is visually distinguished by subtle design enhancements which emphasise its higher performance credentials. At the front, the radiator and lower air intake grilles feature a dark tinted matrix as standard. Larger diameter 9.5J x 20-inch, multi-spoke alloy wheels with Bentley-bespoke Pirelli PZero ultra-high performance (UHP) tyres, lowered and uprated suspension, wider twin-rifled exhaust tail pipes and a new boot-mounted lip spoiler that enhances high speed aerodynamics, reinforce the sporting character of the Speed model. The GTC Speed's 600bhp (610PS) W12 engine develops 9 per cent more power than the standard GTC. However, it is the 15 per cent increase in torque that really distinguishes the Speed model, which now develops an impressive output of 750 Nm (553lb ft). This is achieved across virtually the complete rev range, from just 1700 to 5600 rev/min, delivering that characteristic Bentley wave of torque. The 0-60 mph sprint is despatched in a mere 4.5 seconds (0-100km/h in 4.8 seconds) and 0-100 mph in 10.6 seconds (0-160 km/h in 10.5 seconds). Both Continental GTC models are powered by Bentley's 6-litre, twin-turbocharged W12 engine which is produced exclusively at the company's Crewe engine plant. The Bentley W12 is the most compact 12-cylinder engine in production with 48 valves and 4 camshafts with continually variable valve timing. Power is transmitted via a ZF six-speed automatic transmission. 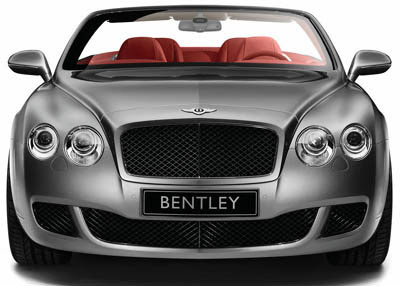 The Bentley Continental GTC Speed is powered by Bentley's W12 engine in its most powerful, 600 bhp (610PS) form. It develops 15 per cent more torque and 9 per cent more power than the 552bhp (560PS) standard Bentley Continental GTC. The Engine efficiency improvements result from the use of lower friction, lighter-weight components and a new engine management system, while twin, low inertia turbochargers with minimal turbo lag contribute to the W12 engine's flat torque curve. In 600 bhp (610PS) form, the W12 develops a maximum torque of 750 Nm (553 lb ft) from 1700 rev/min all the way up to 5600 rev/min. The GTC Speed engine is visually differentiated by the 'crackle black' finish to the intake manifold. This endows the Bentley Continental GTC Speed with a top speed of 200mph (322 km/h) with the roof-up and a 0-60mph sprint time of just 4.5 seconds (0-100 km/h in 4.8 secs). It also accelerates from 0-100 mph in just 10.6 seconds (0-160 km/h in 10.5 seconds). The six-speed transmission can be left in two fully automatic modes (Drive and Sport) or used as a clutchless manual where the driver can change gears sequentially, via either the gearlever or paddles mounted behind the steering wheel. The advanced continuous all-wheel drive system of both GTC models provides exceptional traction in all weathers. The drive is transferred between the front and rear axles via a highly sensitive centre Torsen differential. If the differential detects a deviation in torque demand between the two axles it automatically sends more power to the wheels with greater grip. The 'Sport Traction' mode for the GTC moderates ESP intervention at low speeds, benefiting driver interaction and control, particularly on low traction surfaces. The 'Dynamic Mode' of the GTC Speed allows increased wheel slip at higher speeds compared to the standard chassis. This ensures that torque is reinstated more quickly, allowing the driver to exploit the full potential of the engine. The Continental GTC's steel body has an exceptionally rigid torsional stiffness of around 30Hz that not only minimises 'scuttle shake' but provides a very stable platform for the aluminium-intensive suspension system, optimising its performance. Despite the boost in power and torque for the GTC Speed model, no changes to the body structure were required. For the 552bhp (560PS) GTC, new low-friction dampers provide improved secondary ride (the response of the car to poor road surfaces) and even greater levels of comfort. The Bentley Continental GTC Speed has a range of dynamic enhancements that deliver a more sporting, open-top Bentley driving experience. The retuned Continous Damping Control (CDC) system ensures that the body response matches the inputs from the new sports wheels and tyres, while improved body control reduces pitch and roll when cornering enthusiastically. In addition, stiffer rear axle bushes deliver better axle control and turn-in response. The GTC Speed's suspension is lowered by 10 mm at the front and 15 mm at the rear for improved handling, while the retuned speed-sensitive steering system and solid-mounted front subframe, shared with the standard GTC, benefit steering response. The wider 9.5J x 20-inch multi-spoke alloy wheels, unique to the GTC Speed, are fitted with bespoke 275/35 ZR20 Pirelli PZero ultra-high performance tyres that provide the car with superior grip as well as sharper steering response and feel. To ensure optimum aerodynamic balance at speeds up to 200 mph (322 km/h) the new GTC Speed is fitted with a discreet spoiler on the trailing edge of the bootlid. This provides additional downforce and increases the top speed. For both models, Bentley's carbon-ceramic brakes (CCB) are offered as a cost option. Larger diameter (420 mm front, 356 mm rear), lightweight discs and eight-piston callipers offer fade-resistant braking performance with minimal disc distortion under high thermal conditions. A 20kg weight saving reduces unsprung mass and benefits steering response and handling. This braking system may only be specified with 20-inch diameter wheels and are the largest and most powerful brakes ever fitted to a production car. The standard-fit tyre-pressure monitoring system (TPMS) allows drivers to select tyre type and speed range parameters. As well as monitoring pressures, the system warns drivers if their speed is too high for the tyre pressures. Both the GTC and GTC Speed benefit from subtle revisions to their frontal appearance. The matrix grille is now more vertical and has a more pronounced square edge that accentuates the distinctive Bentley profile. A new lower bumper design with a widened air intake reinforces the sporting stance of both GTC convertibles, complemented by new chrome headlamp bezels. The new design also provides a practical benefit by improving airflow to the more powerful Speed engine by 14 per cent. The Bentley Continental GTC Speed has a unique set of design cues, notably a dark-tinted matrix grille to the upper and lower air intakes, a black lower bumper valance, wider, rifled exhaust tailpipes and 20-inch, silver-painted, multi-spoke alloy wheels. The wheels are available as an option with a special dark tint finish. GTC and GTC Speed customers have a choice of 17 'standard' paint colours including two new colours (Aquamarine and Blue Crystal). The cabins of both GTC and GTC Speed are available with a choice of 6 natural, unbleached, laser-cut wood veneers and 17 premium grade leather hides, Aquamarine. The GTC Speed's cabin is based on that of the Mulliner Driving Specification (a cost option on the standard GTC). It features diamond quilted hide seats with embroidered Bentley emblems, a knurled chrome and hide gearlever and a three-spoke multi-function steering wheel with brushed aluminium switch surround. These are complemented by drilled alloy foot-pedals and 'Speed' logos to the polished treadplates. The standard GTC also receives a new Bentley 'B' brake pedal. A sophisticated follow-to-stop, radar-based Adaptive Cruise Control (ACC) system is now available on both GTC and GTC Speed. It uses a long-range radar sensor, mounted in the lower front grille, to monitor the road ahead for other vehicles. When a slower moving vehicle is detected, the system automatically adjusts the throttle or brakes to maintain a 'time gap', as selected by the driver.